With more than 50 varieties of finches in North America, you can count on a finch sock feeder to attract plenty of bird-watching entertainment right to your own yard. Finches have a natural diet that consists primarily of seeds -- and sock feeders provide an easy way to cater to your local wild finches' appetites. Finch sock feeders are made of thinly woven cloth mesh, typically nylon, and filled with thistle or nyjer seeds, both of which your local finches should find appealing. Finches use the feeders by clinging to them with their feet and pulling the seeds out through the mesh as they eat. 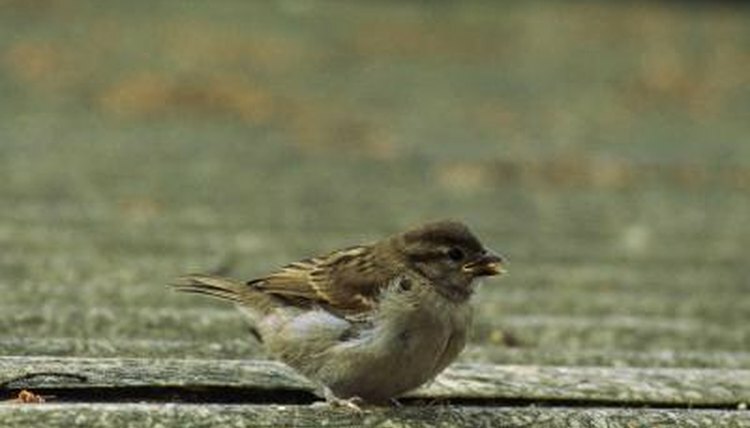 Finch socks do not have perches or ledges attached to them and will not appeal to most other types of birds. You need to place your finch sock feeder in an appealing location if you want it to become a popular hangout for your local finches. Finches will be most likely to use a feeder that is located in a safe area with plenty of resources. The feeder needs to be hanging far enough off the ground that local predators such as cats cannot easily access it. You also must allow the birds at least 5 or 6 feet of easy visibility in all directions so they can spot approaching predators. A birdbath or other source of water will help draw finches to your feeder, as will a source of nesting material. Evergreen trees can provide a good source of natural nesting material for finches. Your sock feeder needs to be hang securely from a post or tree branch that is unlikely to fall over or break. Make sure whatever object you hang the feeder from is strong enough to withstand the regular use that will occur as finches approach and leave the feeder. You may want to consider using a hook to hold up your sock feeder rather than tying it in place, because you will need to periodically fill the feeder. Repeated tying and untying can be an annoyance if your feeder is getting a lot of traffic. Do not be alarmed if you notice what appears to be a pile of seeds building up underneath the feeder. Finches have to crack the outer shell of the seeds in order to access the actual edible portion. The hulls of the shells are going to accumulate underneath the feeder as the finches eat. However, if you are finding shells that have not been cracked open, you should inspect your feed sock for tears. Since feed socks are made of mesh, they are relatively fragile and have a tendency to tear over time. Also, be aware that feed socks give seeds minimal protection from the elements. Seeds that get soaked in the rain will mold, and your finches won't eat them. Try to avoid putting out more seed than your finches can eat within the course of a few days, because leftover seed may ruin after bad weather strikes.